This entry was posted in From Zojirushi America and tagged bread, dough, glutenfree, Zojirushi by Zojirushi America Corporation. Bookmark the permalink. Do you put the wet yeast which has fermented in the middle of the flour, or jus a dry yeast? Is the regular wheat setting the same as wholewheat setting on other machines? Yes, the Regular Wheat is the same as the Whole Wheat setting! Hello, I just started a sourdough gluten free culture and I’m very excited to try it in my breadmaker. Which setting would you recommend? The sourdough starter setting or the gluten-free setting? Thanks! My coffee maker exploded and soaked my wife’s BB-PAC20 Operating Instructions & Recipes manual. Where can I purchase a replacement? Hi there! You can visit https://www.zojirushi.com/support/manuals_breadmakers.html to get manuals online, or call 800-733-6270 and press 1 if you’d like a printed version. Hi Chris, the maximum is approximately 5 cups. Hi! I just purchased the zoj virtuoso and I made my first loaf and it was delicious but WAY too tall and big. I converted an 1.5 pound to 2 pound but my question is could I just use the 1.5 recipe and not convert it that way it won’t be so big and so much?? What is the optimum temp of the liquid ingredients before u place it in the baking pan, About 70 degrees? We keep our house temp about 64 degrees. I created loaves with the the ingredients at our room temp, liquids, eggs, yeast and solid ingredients also. Then I had the liquid ingredients at about 105 degrees, about what I would do when I manually develop a loaf. I guess that wasn’t a good idea. The manual doesn’t really tell you the initial temp u should have ur ingredients at. And having the default rest period at 9 minutes doesn’t seem to be the answer. The Yeast is good just FYI. What do u think? Hi Gary, as long as your home is not below 50°F or above 77°F, there is no need to adjust the temperature of the water. The breadmaker has a preheat or rest cycle during which the heater turns on and off depending on ambient temperature, to stabilize the temperature of the ingredients in the baking pan. If you’re still having trouble, please give our friendly customer service team a call, they’d be happy to help! Call 800-733-6270 anytime Monday-Friday from 8:00AM-5:00PM PST, or send them a message at support@zojirushi.com. How do I make the bread shorter is there some way to adjust the basic white bread to make it not go so tall please. 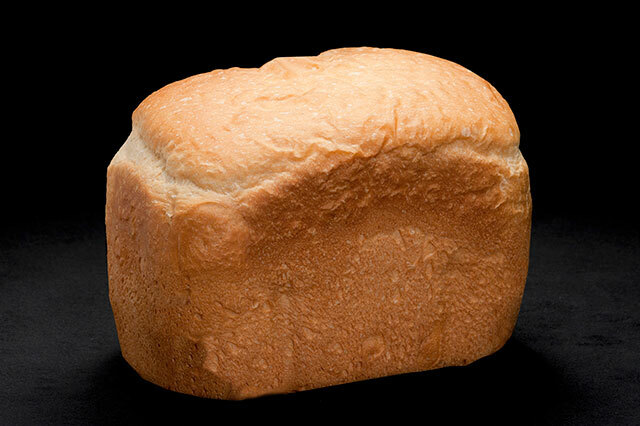 Hi John, if you own the BB-PAC breadmaker, there is a recipe for 1.5lb basic bread in the REGULAR BASIC section on page 15 of your user manual. Hope this helps! 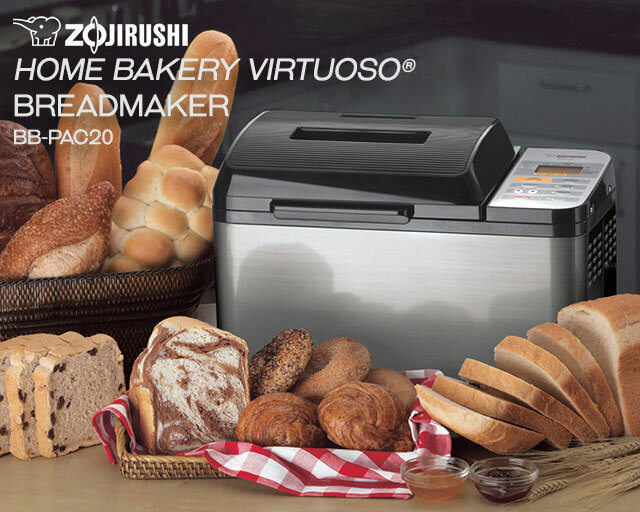 Is it possible to make a smaller loaf 1 or 1.5lb in your Zojirushi Home Bakery Virtuoso 2-Pound Bread Maker by adjusting the ingredients? Hi Kathleen, 1-1/2 lb. loaves will be your minimum for the BB-PAC20–you can find recipes for this reduced loaf size on pages 15 and 18 of your user manual. Hope this helps! I am a first time user of the zojirushi breadmaker. I have put in all the ingredients and selected the course and pressed the start button. The rest is displayed on the screen. May I know if I need to do anything else or leave it to run by itself? How long do I have to wait before it starts to knead? Hi Elaine, the REST cycle is designed to stabilize the temperature of the ingredients prior to kneading, and takes about 30 minutes on regular courses. If you’d prefer to turn it off and have the unit go straight into the KNEAD cycle, please follow the directions on page 9 of your user manual if your model number is BB-PAC20. How do you adjust the time and temperature for gluten free bread, since I don’t have a special button for “gluten-free”. I have model BB-CEC20. Hi Larry, thanks for your question. Our customer service team can actually walk you through how to program your breadmaker to make gluten free bread. If you’d like, give them a call anytime Monday-Friday from 8:00AM-5:00PM PST by dialing 800-733-6270 (press 1), or email support@zojirushi.com for further instructions. We hope this helps! Hi, I’ve been using Zojirushi bread makers for almost 20 years. The BB-CC 20 is the third one I have. I have the impression that the oven temperature is a little low, is there a procedure to check and validate it? I have the instruments I need, only need the procedure. Thanks! Hello! Sorry to hear you’re having trouble. It could be an issue with the recipe. Would you mind contacting our customer service team, and they should be able to troubleshoot with you. And if, it is a problem with the temperature, they can help you make arrangements with a repair center. If you’d like, give them a call anytime Monday-Friday from 8:00AM-5:00PM PST by dialing 800-733-6270 (press 1), or email support@zojirushi.com for further instructions. We hope this helps! Thank you! Sorry I couldn’t reply earlier, I was out of the country… Anyway, I am sure there is not a recipe problem, I am baking by this recipe for many years, across three generations of Zojirushi bread-makers. – machine takes 630 to 637W of power when the heaters are on, which cycles, being off about 40% of the time. – Inside the pan, temperature stabilizes at 273-275F after 30 minutes of baking (with a thermometer fixed on the front interior side of the empty pan and the cover closed), and I think this temperature is way too low. Thank you again for advice! I tried to make a gluten free bread using a home made cycle, but at the end of the knead cycle I opened the lid to smooth off the top of the dough and when I closed it the machine started to knead again instead of going into the rise cycle. I tried to cancel that cycle to go into rise, but it just kept restarting kneading. Does it restart the knead cycle from the beginning if the lid is opened? This doesn’t work well with gluten free recipes. Also why can’t we change the crust setting on home made cycles? I would think that should be possible. And, is it normal for the machine to make a “grinding” sound intermittently during the kneading process? Hi Jodi, I’m sorry to hear you’re having trouble with the home made cycle. Would you mind giving our customer service team a call, since they would be able to better help you with your questions and issues. If you’d like, give them a call anytime Monday-Friday from 8:00AM-5:00PM PST by dialing 800-733-6270 (press 1), or email support@zojirushi.com for further instructions. We hope this helps! Hi Tina! 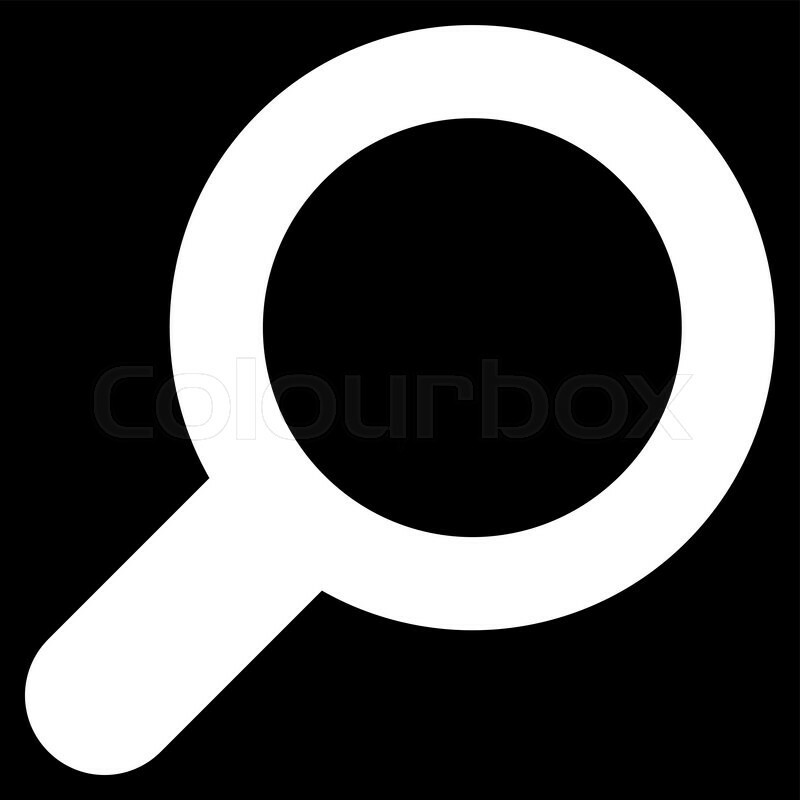 We are only able to guarantee recipes that we have tested, such as the ones found in the instruction manual or on our website. The recipes in the instruction manual have been specifically written for the Home Bakery Virtuoso. We have not tested any box mixes and find that often times will require adjustments per the suggestions and instructions of the box mix manufacturer. Hi Sarah! The baking temperature of the Home Bakery Virtuoso depends on the CRUST CONTROL selected. 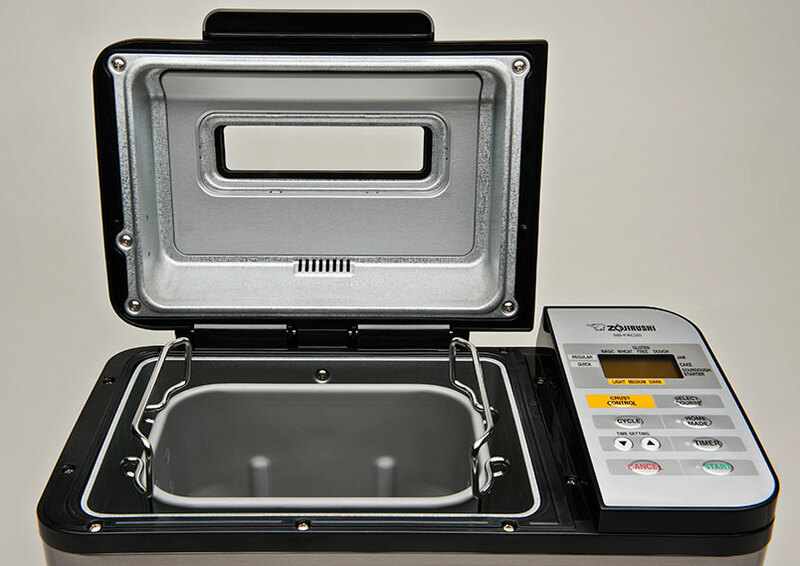 There is no set temperature, as the unit is pre-configured and self-adjusts depending on the size of the loaf (either a 1.5 lb. recipe or 2 lb. recipe). It can range at approximately 248 °F to 302 °F. Hope this helps! Hi Gina! The preprogrammed gluten free course was specifically designed to achieve the best results when baking gluten free bread recipes. Although there is research indicating that one rise is best for gluten free breads, after thorough testing and research we found that our gluten course works best when using our bread machine. I have a Zojirushi BB-PAC20. I have had it for alomost two years without any problems. Actually, I love this machine. Today I went to bake a loaf and the select course button would only let me choose regular or quick and jam, cake or sourdough. When pushing the ‘select course’ button, the indicator skipped over the basic, wheat, gluten free, and dough catagories. Please advise. Hi Tina! Please contact our customer service team at https://www.zojirushi.com/app/customer_service/entry. So far, I love my BB-PAC20 bread machine. I have tried a few recipes on the manual that came with it. However, I would like to try some hearty bread types. Do you have a bread machine recipe book that you can recommend for this machine? Thank you and I am looking forward to receiving your recommendation. Hi Cynthia! Thank you for your inquiry. Additional bread machine recipes can be found on our website: https://www.zojirushi.com/app/recipe/breadmakers. Please contact Zojirushi America Customer Service at 1-800-733-6270 for further assistance or email support@zojirushi.com. I have the PAC20, and want to just knead some dough (milk bread) for 20 min. I’m using the home made program and turned off everything except knead. If just noticed that the heater must be on, because it is quite warm. Is this standard? What temperature does it maintain during knead only? Thank you for your inquiry. There is no active heat during the kneading cycle. Please contact Zojirushi America Customer Service at 1-800-733-6270 for further assistance or email support@zojirushi.com.